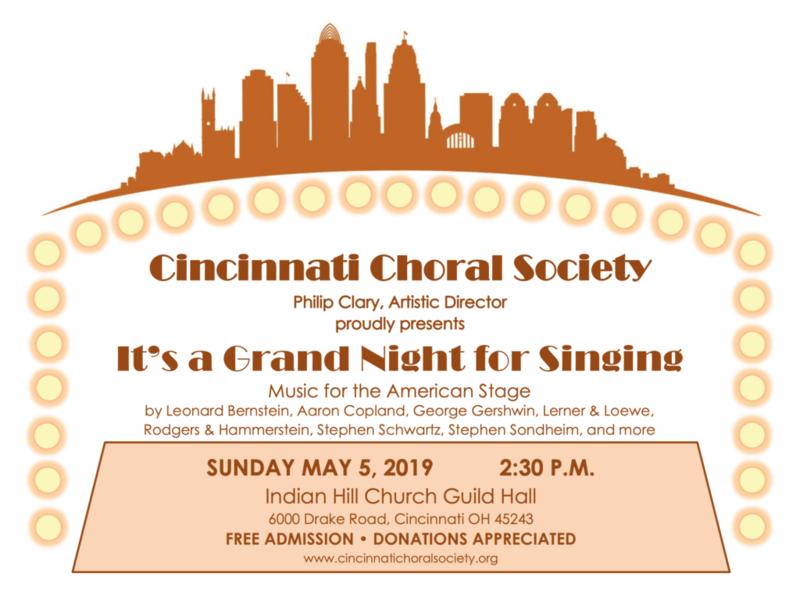 On Sunday, May 5th, The Cincinnati Choral Society will present “An Evening of Choral Music from the American Stage”, aptly subtitled, “It’s a Grand Night for Singing!” The group will perform choral numbers from both American opera and musical theater including music by Aaron Copland, George Gershwin, Frank Loesser, Rodgers and Hammerstein, Stephen Sondheim, Stephen Schwartz and many more. The long-established Cincinnati Choral Society, under the direction of Philip Clary, will be joined on the program by two pianists, bass and drums. It will be an enjoyable evening of great American stage choral standards and will include musical theater trivia questions for the audience as well as a “Sound of Music” singalong. The concert is at 2:30 pm at Indian Hill Church, 6000 Drake Road. It is free and open to the public. We hope you will come and join us on May 5th! Now auditioning for our 2019 season! Are you a singer? Looking for a choral group in the Cincinnati area? Come sing with us! 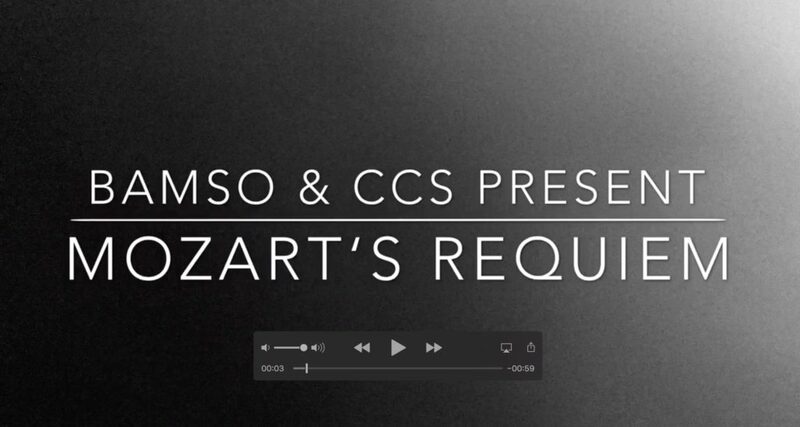 CCS is now auditioning for our 2019 Season! Press the big blue audition button below to tell us about yourself and schedule an audition. 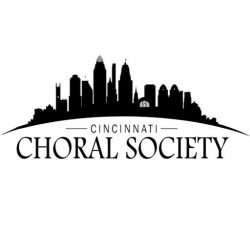 To find out more about the Cincinnati Choral Society, click here. A CCS annual tradition continues by performing with BAMSO at their Kindel Memorial Holiday Concert. This year’s theme will be “Christmas in the Movies”. Admission is free (goodwill offering). A big THANK YOU to everyone who attended our May concerts. The next time you can see and hear the Cincinnati Choral Society is before the FC Cincinnati game on Aug 18, 2018 at Nippert Stadium. We will be singing the National Anthem right before game time at 7:30pm. Hope to see you there! Video from our last practice! Our concert is this weekend, Sat May 5, 7:30pm at Indian Hill High School Auditorium and Sun May 7, at 2:30pm at Indian Hill Church. Check out this video from our last practice! Here is the May Concert Poster! Special thanks to Nancy Harward for creating another beautiful poster! 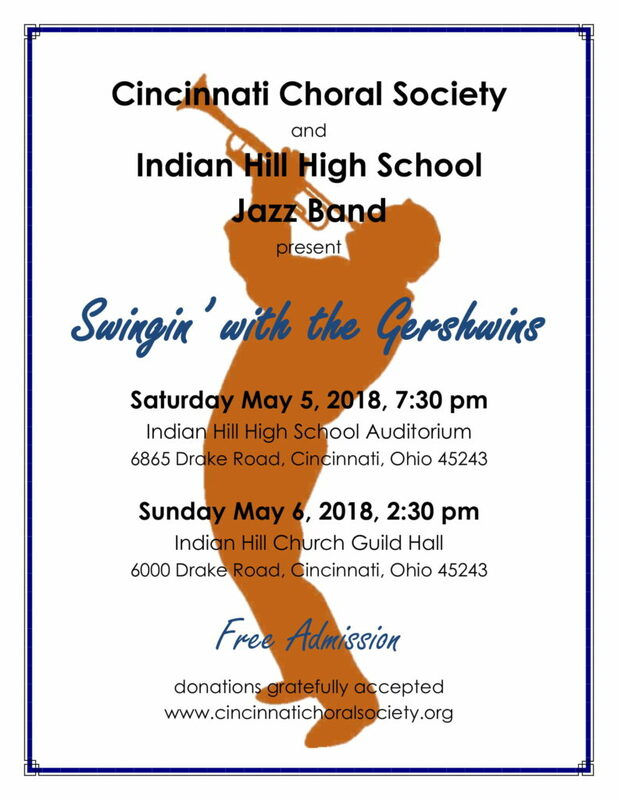 CCS Spring Concert is Swingin’ With the Gershwins featuring the Indian Hill High School Jazz Band. There will be two performances, the first at the Indian Hill High School auditorium, and the second at Indian Hill Church. Both concerts are free (goodwill offering). We wanted to take an opportunity to thank everyone who graciously donated during this concert cycle, in our internal member “funraising” campaign, and throughout 2017! It is because of your generous donations that CCS can continue to grow and try new, exciting projects like our “Poet Speaks” concerts that featured a winning poem from a Hamilton County high school poetry competition set to music from a Cincinnati-based composer, and our most recent Mozart Requiem collaboration concerts with the Blue Ash Montgomery Symphony Orchestra. We would also, however, be remiss not to reach out during this charitable time of year to remind friends and family that there is still time to donate to the Cincinnati Choral Society! So if you already have donated this year, then here is another huge THANK YOU for your continued support! And if you haven’t donated recently to CCS but you would like to, then please visit us at www.cincinnatichoralsociety.org. Thank you for your interest and support! May your friends and families have a safe and wonderful holiday season! Sunday, December 3, 7:00 pm – Montgomery Assembly of God Church 7950 Pfeiffer Road in Montgomery. CCS will perform with BAMSO at the annual Kindel Memorial Holiday Concert. This concert has become the traditional beginning to the holiday season for Blue Ash and Montgomery residents. Want to hear our home page video? Click here to hear our home page video. Cincinnati Choral Society presents "A Celebration of Music in Spring" available on Spotify, iTunes, Apple Music, Amazon, and Google Play. Checkout the CCS YouTube Channel!